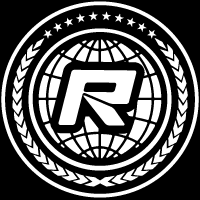 Practice continues in Sweden at the first ever Euro Offroad Series race with drivers having completed three five minute runs on the indoor clay Tomelilla track. With a racing groove starting to appear drivers have two final opportunities to get their cars dialed-in ahead of the first round of qualifying. While times from the opening three practice don’t count for anything, each driver’s three fastest consecutive laps from P4 or P5 will count towards reseeding the heats. 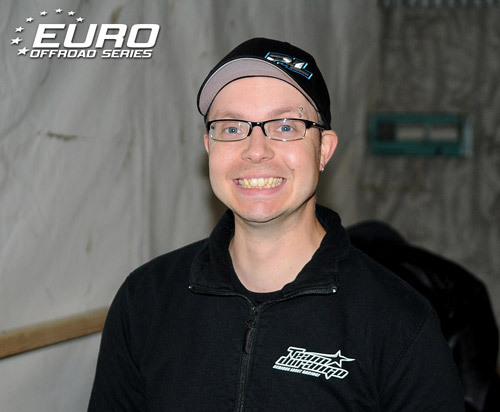 Racing in all four of the classes that make up the race programme at the EOS pilot event, Team Losi Racing’s Dustin Evans is the busiest man in the pits. The 25-year-old from Colorado is running both buggy classes along with 2WD & 4WD Short Course truck and other than a smokey speedo failure in his 4WD SC Truck has had to do very little to his fleet of cars. Describing both his buggies handling as awesome he said track conditions have improved with it becoming a lot more consistent than this morning. Team-mate Martin Bayer is making his electric racing debut this weekend and after his opening runs is very upbeat about his chances. A 1:8 Offroad gas driver, the former European Championship podium finisher said he is still learning each of the three electric cars and trying to reduce the number of mistakes he is making but is already looking forward to qualifying. Two time World Champion Ryan Cavalieri said other than loosing a wheel nut off his Associated B44 in the third practice everything has been going well. The American star who along with his regular buggies is running 4WD Short Course with Associated’s new SC10 4X4 is still getting used to the unique hard-packed track surface. AE team-mate Peter Pinisch had little to report, the former European Champion saying he was happy with his day so far. Kyosho are looking strong with their two local young guns Mikael Johansson and David Ronnefalk. The 2WD Swedish National Champion, 16-year-old Johansson is very happy with his 4WD but said his 2WD still needs work and he plans to change shocks for P4. Ronnefalk is very happy with his 2WD car but can not get his 4WD to work. The Swedish 4WD Champion is struggling with the back end of his Lazer being very loose and will make some major changes to try rectify the problem. Kyosho designer Shin Adachi was much happier with the track conditions and is happy with his 4WD but said he is still finding 2WD tough. This weekend Adachi’s cars are not running in his distinctive land of the rising sun colours as the tragedy that hit his home country of Japan has affected his regular body painter hence the white bodyshells here in Sweden. 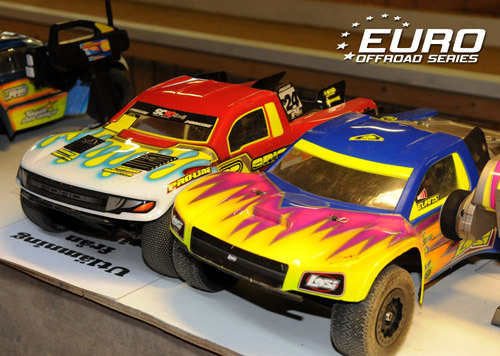 Team Durango’s Hupo Honigl is very happy with his three cars, the Austrian running buggy and 4WD Short course. The multiple European Champion feels the choice of controlled tyres being used here is not the best option for the conditions but as its the same for everyone its not a huge problem. Team-mate Joern Neumann said his 4WD cars are good but in 2WD he is struggling with a lack of traction. 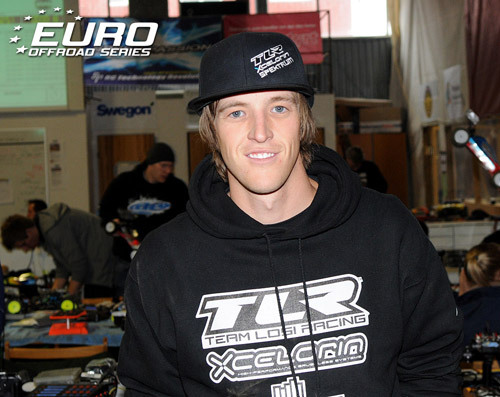 Heading up the Tamiya Racing Factory squad Lee Martin broke his TRF511X in P3. Breaking the rear right suspension arm he said he tried a softer oil and it didn’t work so he will revert back to his morning set-up. Team-mates Marc Rheinard and Viktor Wilck had little to report.